Graduate of Trinidad State Junior College and Colorado State University-Pueblo with a Bachelor of Science degree in Biology. Currently pursing a Master of Arts degree in Foundational Mathematics from Ball State University. Began teaching mathematics at Trinidad State in January of 1997. Appointed Coordinator of the Math Lab in 2001. Served as division chair of developmental education for two years. 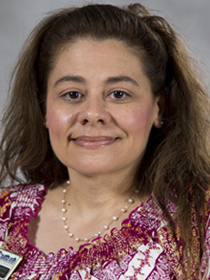 Named Faculty Member of the Year for the 2007-2008 academic year.